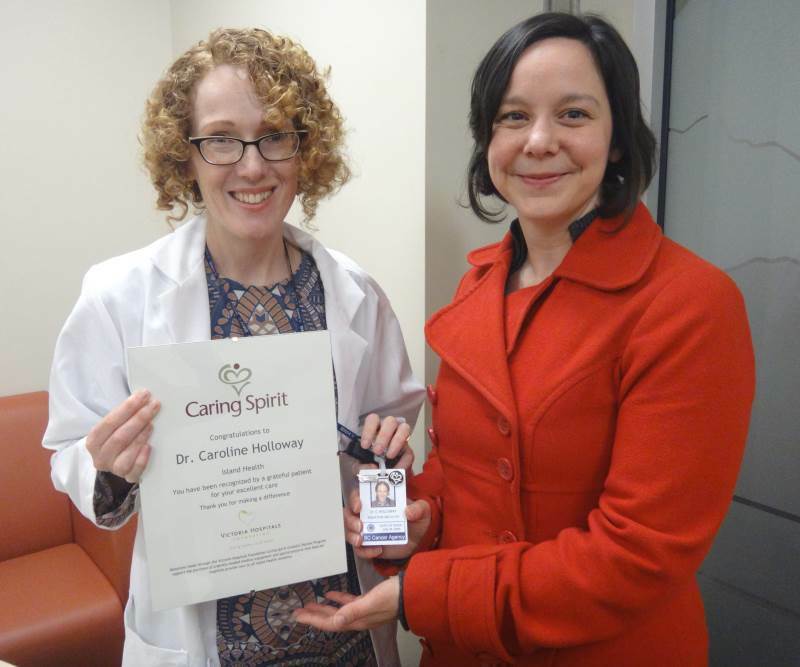 Congratulations to Dr. Caroline Halloway at Royal Jubilee Hospital on receiving another Caring Spirit award! The grateful daughter of one of her former patients has made a donation in Dr. Halloway’s honour in tribute to her mother’s experience in her care many years ago. The donor’s generosity will directly help to continue and improve patient care in Cancer Care. Thank you. Two in five Canadians will be diagnosed with cancer in their lifetime. With the right equipment, doctors can quickly diagnose the disease and give quality care that dramatically improves their chances for full recovery. Last year, medical teams at our hospitals provided exceptional and compassionate care to 2,471 people with cancer. At Royal Jubilee and Victoria General hospitals, patients with cancer are treated by a team of experts who use a combination of surgery, cancer medication, radiation, chemotherapy or hormonal therapy. All are proven to increase remission, extend life or improve quality of life. Royal Jubilee is the host hospital for the BC Cancer Agency. The BC Cancer Agency refers patients from across BC to both our hospitals for diagnosis, consultation with oncologists and therapy, providing seamless care for those fighting cancer. The average hospital stay for someone in Cancer Care is a week. While patients receiving medical attention for cancer can be cared for throughout our hospitals, those requiring chemotherapy and radiation therapy stay at Royal Jubilee Hospital’s Patient Care Centre. Here, staff are specially trained to administer chemotherapy, respond to emergencies and manage side effects from medication. The Patient Care Centre is home to the only unit on Vancouver Island where patients with cancerous tumours can receive a treatment called radiotherapy. This therapy can treat tumours and prevent recurrence after surgical removal. Three lead-lined rooms in the Patient Care Centre are also used for radioimmunotherapy — a new form of chemotherapy that targets specific sites in the body at a molecular level. Victoria General Hospital is home to the region’s Breast Health Centre, where essential screening and diagnostic procedures are performed. Breast cancer is the most common cancer among women in BC, with an estimated 3,000 women diagnosed in 2012. Advanced equipment in this area improves the likelihood of early detection and more positive outcomes. The Victoria Hospitals Foundation would like to thank the Caring Spirit donor for her generous gift and congratulate Dr. Caroline Halloway on the well-earned distinction! Service like hers immeasurably improves quality of life for patients on Vancouver Island.